The wonderful thing about the props and costumes that make their way through Disney’s Hollywood Studios is that repeat guests get to regularly see pieces from new and old films alike rotated through the park's galleries. The bad news is you never know when a piece you’re attached to will disappear. 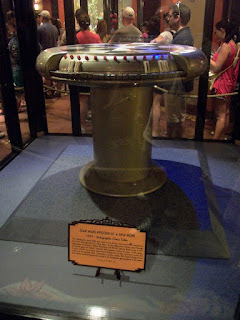 Such is the case with today’s artifact, the holographic table from the Millennium Falcon that resides in the queue for The Great Movie Ride. I can remember marveling at this piece as a teenager before it was moved to make way for new props. Luckily, it has once again returned! 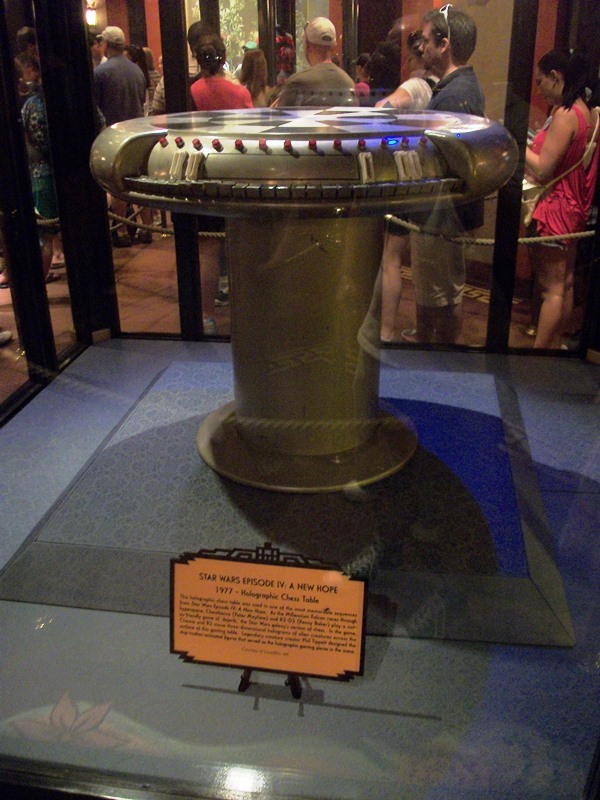 This table comes into play in the original Star Wars – Episode IV: A New Hope. While soaring through hyperspace Chewbacca and R2-D2 engage in a friendly game of dejarik. Many equate the game to chess, and while there are similarities, the Star Wars universe does in fact have chess. Given that both games are played on checker patterned boards and are based on combat strategies, however, it makes for a perfectly reasonable comparison. Dejarik was a creation of the Jedi as a way to hone their perception and combat skills, but became popular throughout the galaxy. Just as portrayed in the A New Hope, the dejarik pieces are holograms that range in size from five to thirty centimeters and move as the creature they are modeled after would move and attack or die. I would give you the names of some of these creatures, but I’m fairly certain you would think I am just making up nonsense words. Creature designer Phil Tippett crafted each of the pieces which were filmed with stop motion. Just like real creatures and players alike, if the pieces are left unmoved or if the game is abandoned for too long and not turned off, the pieces will begin to show the signs of boredom. Roundtable Contributors: Estelle Hallick (This Happy Place Blog), Alan Mize, Blake Taylor (BlakeOnline.com), Andrew (Disney Hipsters Blog) and yours truly. 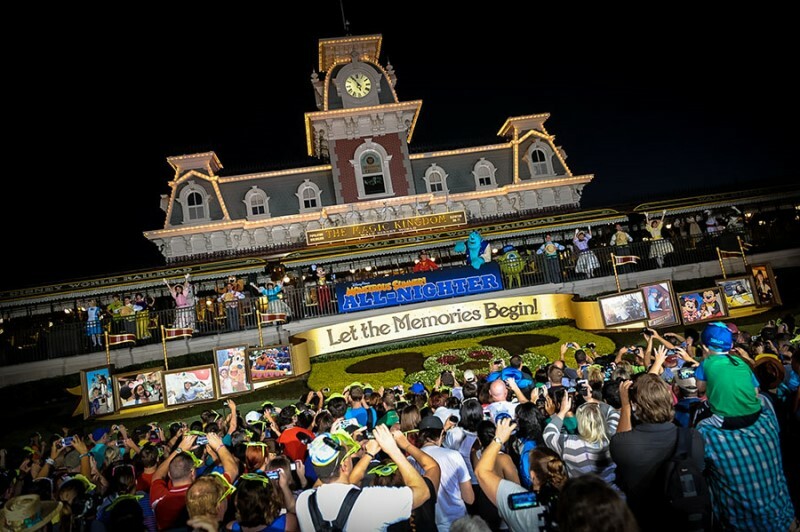 After 2012's test run of a 24-hour operating day for the Magic Kingdom, the park approached last week's Monstrous All-Nighter with experience and expectations that were not afforded last time. Now that the park knew what an event like this felt like, it could have some fun with it. Among the plusses made to the event included two runnings of the afternoon parade, a webcam that streamed all 24 hours online from Town Square, and the underlying Monsters University theme that tied everything together in a much larger way than anticipated. A party in Tomorrowland, exclusive dessert treats, and Mike and Sulley galore (they were everywhere!) really hit the MU theme out of the park. Arguably the most fun plus was the small (but magical) closing ceremony. 2012's 24-hour day ended with no fanfare whatsoever, so it was a real surprise when, at 5:45 a.m., the DJ at the Castle dance party instructed everyone to make their way to the train station for a special goodbye moment. (YouTube that thing right now.) It was Disney doing Disney at its finest. While eyelids were fluttering and feet were sore by the time the 24 hours were up, a fun time was had by all (except for maybe more than a few guests caught in the post-Wishes mob... but let's save that story for next week). Early next week Disney will begin testing the new Wilderness Explorers attraction at Disney's Animal Kingdom! Though little information has been released, the game will loosely be based on Disney/Pixar's Up. Russell (who is a Wilderness Explorer in the film...) already has a meet and greet centrally located in the park. I have a certain apprehension when it comes to all of the new "interactive game" style attractions that Disney has been installing lately. Sure, I enjoyed Kim Possible (the first of these games...) but the Agent P's World Showcase Adventure that replaced it has turned out to be a dud. Sorcerers of the Magic Kingdom also turned out to be all but useless after a few plays as well. If it weren't for the latest game to roll out, Pirates Adventure: Treasures Of The Seven Seas, I would be adamantly against this. As it were, the Pirates game was executed flawlessly, and gives me new hope for these types of attractions. The fact that there will be multiple sign up kiosks does bother me somewhat. The centrally located station of the Pirates game is less obtrusive than the multiple Agent P stations. On top of that it is well themed and blends into the area quite well. Lets all cross our fingers. I’m a Disney nerd, but you already knew that. And since you’re reading this right now, I’d be willing to bet that you are too. Despite the fact that I am a self-professed Disney nerd, I have never really had an interest in joining the official Disney fan club, D23. The magazines that come with the higher level of subscriptions seem really nice and I’d love to read them, and it seems that you can get some really great merchandise, too. But those things just aren’t enough to entice me into taking the plunge. This week however, Disney made an announcement that awoke the fan boy in me and really made me want to join D23 for the first time. 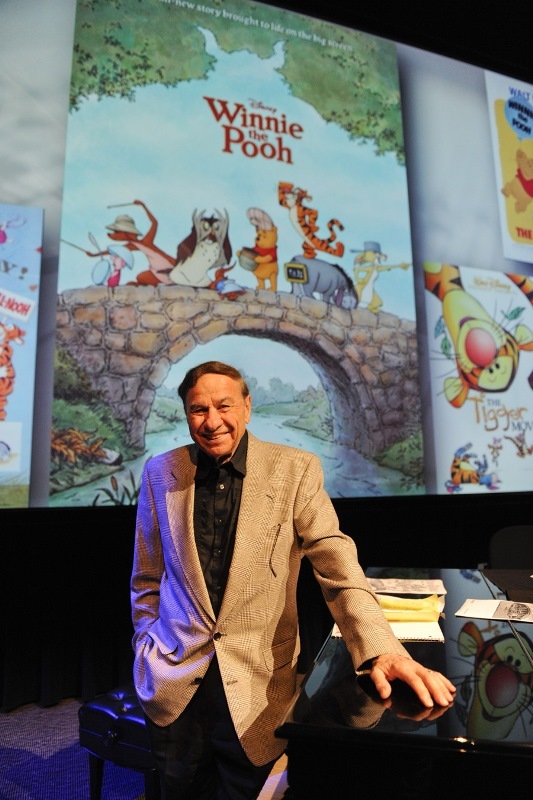 On Saturday August 10th, two absolute Disney Legends will be performing on stage together. Richard M. Sherman and Alan Menken will be performing in a show entitled “Richard M. Sherman and Alan Menken: The Disney Songbook” and the musician in me is absolutely giddy with the thought of seeing those two giants of Disney music history come together. If it’s a famous Disney song, there’s a very good chance that it was written by either the Sherman Brothers or Alan Menken. From “Carousel of Progress” to “Aladdin”, these men cover more than 50 years of Disney music and to see them in concert together would be a once in a lifetime opportunity. Sadly, I’m not a member of D23, and I also live on the east coast, so this concert probably isn’t going to happen for me. I’ll just have to keep my fingers crossed that video of the performance is made available so I can see what will surely be a fantastic concert. I'm going with a bit of lighter news this week. Let's focus on the ice cream (my current mindset because it's been so humid in New York). L’Artisan des Glaces, a nook full of sweets, opened up in Epcot's France pavilion this week. Oh oh oh, does it look adorable! When you don't get a new attraction in the World Showcase, second best is always dessert. Unless you've been living under a soundproofed rock for the past day or so, you are aware that France newest snack location, L'Artisan des Glaces has opened. Housed in the former Boulangerie Patisserie, the shop serves up ten flavors of ice cream and six flavors of sorbet in waffle cones or cups, all made in house, with an option to add a shot of liquor to selection. Your grandmother's kitchen atmosphere, or at least it felt precisely like my grandmother's kitchen, has not been swept away entirely, but a thematic change has been made to make L'Artisan des Glaces feel a bit more like a creamery and less like a kitchen. One key component to the L'Artisan des Glace is the ordering procedure. You order and pay at one of two registers before moving on to have your ice cream cone or cup prepared. No longer will you have to fumble with your wallet or purse while your ice cream begins to melt and drip on you, the counter, and everywhere in between. Also, there is only one counter, taking away the cramped feeling the previous occupants had to contend with when they had two counters and two lines of guests in the same amount of space. Do I miss the old bakery case in the window? Sure I do! However, from everything I have seen and heard from those who sampled the goods yesterday, I'm willing to bet that fresh ice cream and sorbet can make me forget my troubles. Some restaurants are tough to get into because of their reputation and some because of their location. It is rare to find a restaurant with impeccable food, a prime location, and one that you can, on occasion, walk into without a reservation. The Grand Floridian Cafe just happens to be one of these locations. The Grand Floridian Cafe offers spacious rooms that can seat several groups at a time, but each table feels quaint and cozy. They are filled with all of the Victorian charm found throughout every nook and cranny of the resort. The restaurant’s staff is friendly and insightful, and quick with a recommendation if you seem to be struggling between multiple options. The Disney name is known for film, theme parks, and entertainment. Yet, more and more, those in and around the Disney community are becoming known for their vineyards. The Grand Floridian Cafe offers up a selection of wines from Fess Parker, Fred MacMurray (MacMurray Ranch), and Walt Disney's daughter, Diane Disney Miller and her husband, Ron Miller (Sliverado). I opted for the Silverado Cabernet Sauvignon which, while expensive, was one of the smoothest glasses I have had in recent memory. For my main course I went with the Orecchiette Pasta. The pasta is tossed with an Asiago cream sauce, peas, grilled chicken and topped with prosciutto. 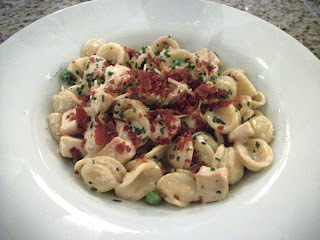 The orecchiette is thick, but tender to the fork and the teeth. The chicken is cubed into bite sized pieces, but still has some great charred bits from the grilling process and it retains its natural juices. The peas are so fresh they pop as you bite into them. The prosciutto is shaved and crispy. There is a high salt content between the prosciutto and the ridiculously rich Asiago cream sauce, although it isn’t so salty that it turned me off of the dish. Pasta is an easy thing to accept mediocrity in, but that is not the case here, everything is fresh and has a homegrown, classic taste to it. On the dessert tray there are a ton of tasty pastries, but I couldn’t resist the Seasonal Sorbet, which happened to be mango on that particular day. 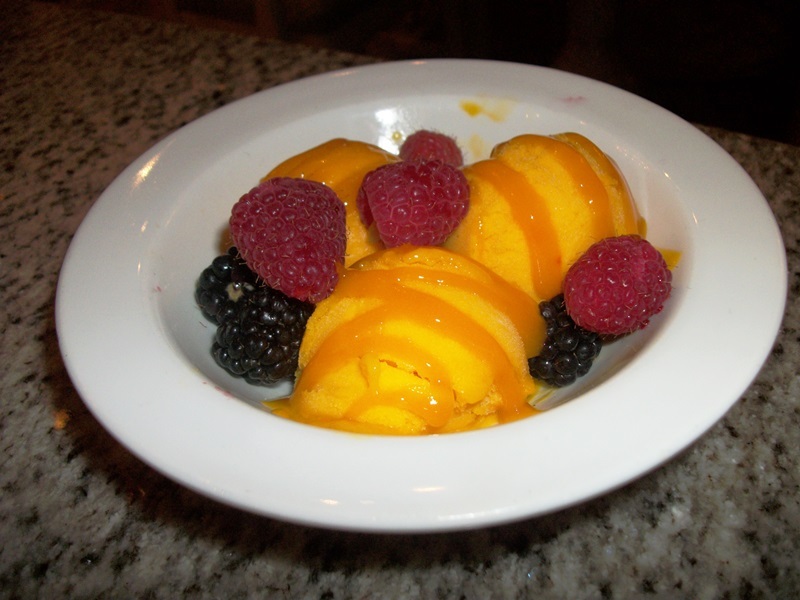 Three generous scoops, topped with a concentrated syrup, burst with the tropical flavor of the mango. Combine that with fresh blackberries and raspberries and you have one tasty treat that can cleanse your palate and leave you begging for more! The Grand Floridian Cafe uses the best possible ingredients but never seems to be overrun by guests. I imagine a big reason for that is the fact that there are so many quality dining establishments around The Grand Floridian, but that doesn’t mean the Cafe should be overlooked or passed by. In fact, I believe the lack of lines should be relished by those who are smart enough to stop by. Tonight we’re gonna party like it’s 1989. 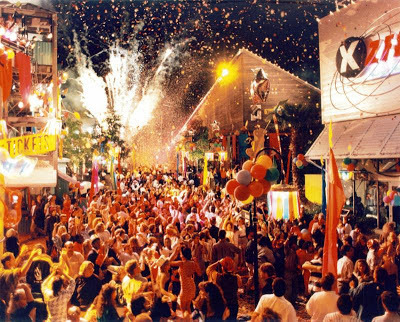 If you were going to party in Walt Disney World in 1989 the place to head was Pleasure Island, which opened in May of that year and celebrated New Year’s Eve every night. This photo was taken from down near The Fireworks Factory, which would later become Motion and, after the closure in 2008, now an empty lot. Between the pyrotechnics, clouds of smoke, and blizzard of confetti, however, there is a lot here to remember and marvel at. First up, right on the right, is the XZFR Rockin’ Rollerdrome. There is a lot of history just in this one spot, but we’ve talked about it quite frequently here on the Gazette. You can see some Rollerdrome concept art and read a bit of the location’s history or read what the fictitious, but hilarious, Pleasure Island Historical Society has to say about the site that was anchored by a band known as Time Pilots. Tucked around the corner is Doodles, a t-shirt shop that specialized in popular graphic designs that were printed on shirts and other accessories. Across the walkway, where the Ticket sign hangs in blaring yellow, is The Island Depot. This was the location for guests to pick up stroller and wheelchair rentals, as well as an assortment of sundries, from film and cameras to shirts and Pleasure Island logo items. Down the street is an angular building that looks like the home of Paradiso 37. As it turns out that is the future home of Paradiso 37, but in 1989, however, it housed YesterEars. You can see the beginning of the word Yester and a classic Mickey Mouse on the sign peeking out from behind the palm tree. This merchandise location focused in on the 1930s and 1940s, hence the vintage Mickey form, and sold a variety of character memorabilia and products. Pleasure Island had a long and storied history, both real and born from the minds of the Imagineers. Sometimes I love just getting lost in a moment of those times, and this is one of those perfect pictures that really lets you feel what it was like to walk the streets of New Year’s Eve every evening. 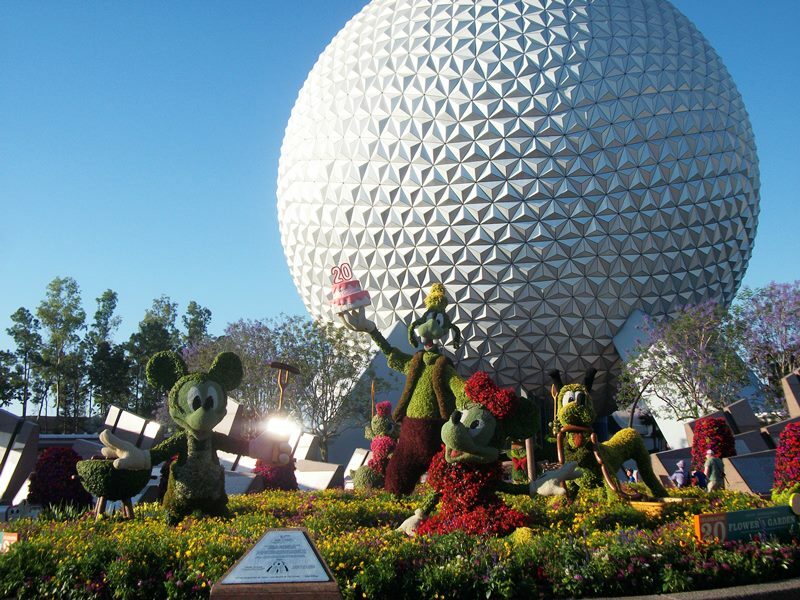 Are Epcot’s festivals simply becoming modified versions of one another? At this point does it matter if you visit in the spring or the fall, because both the International Flower & Garden Festival and the International Food & Wine Festival are beginning to offer similar opportunities? As with most conversations that deal with Walt Disney World the answer is not a simple yes or no. The Marketplaces, the little food serving cottages and the longtime standard the International Food & Wine Festival, crept into this year’s incarnation of the International Flower and Garden Festival. Flower and Garden’s kiosks focused on items grown in gardens, which put fruits and vegetables at the forefront of every dish. 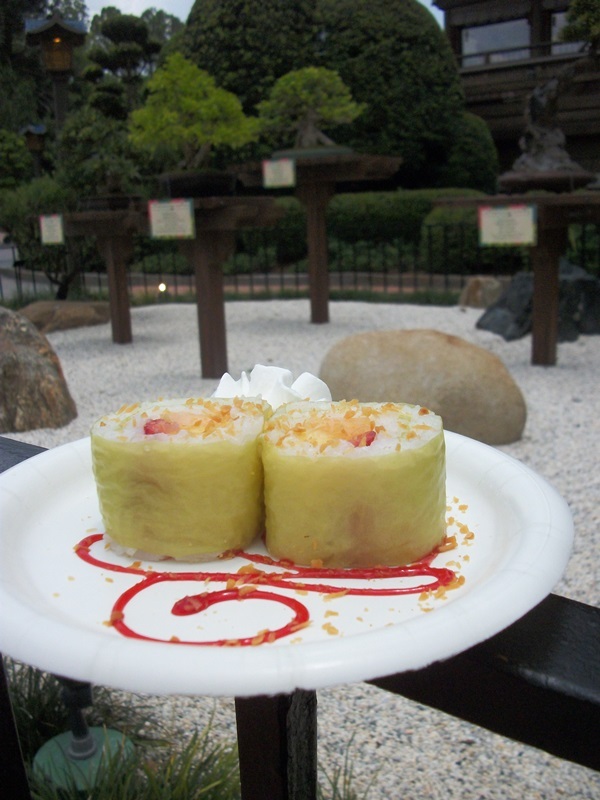 Food and Wine’s venues always focus on the freshest ingredients, but there generally isn’t a theme that runs through all of the Marketplaces as there was with Flower and Garden in 2013. Also, the number of Marketplaces needs to be considered. Flower and Garden weighed in with only about a dozen venues while Food and Wine typically boasts an assortment of kiosks just under thirty. 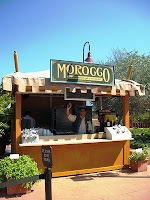 Switching main components, what about topiaries at the International Food and Wine Festival? They are there, but like the Marketplaces at Flower and Garden, there are nowhere near a comparable number in the fall. 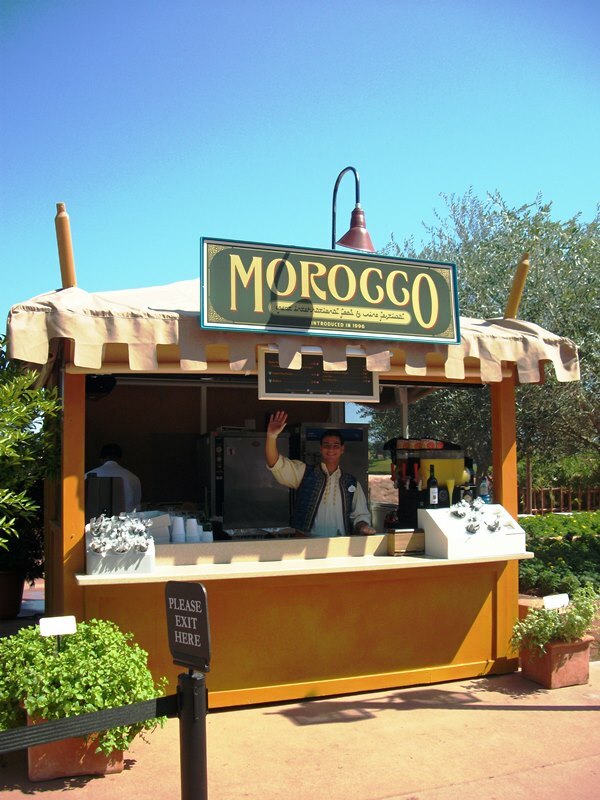 The garden areas of World Showcase are well manicured all year round, but during Food and Wine they do tend to take a slant towards ingredients in dishes. 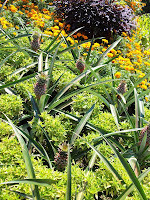 Cabbage in Morocco, pineapples and peppers in the promenade entrance, and the list goes on and on. So, while there aren’t as many topiary figures, the gardens are still an attraction unto themselves during Food and Wine. The Festival Center, housed in the former Wonders of Life pavilion, is always abuzz with activity no matter which event you are attending. There is a difference, however, in who the special guests are. Chefs and culinary experts arrive in the fall to help guests in their kitchens and prepare some amazing dishes. Garden designers and horticulturists come along in the spring to assist guests in getting the most of their outdoor spaces. Even the merchandising opportunities, aside from the typical logo gear of the given event, are dramatically different. Then there are the intangibles. 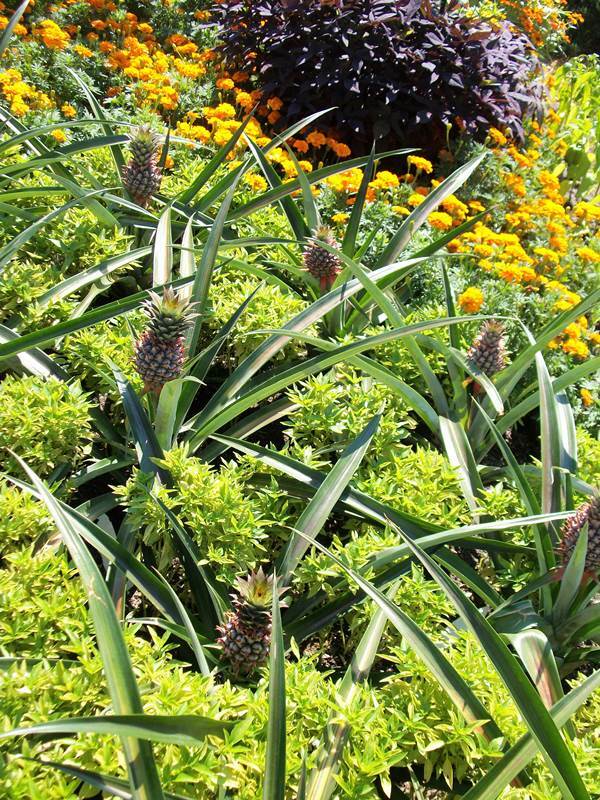 Where Food and Wine has extra Marketplaces, Flower and Garden has water wise, butterfly, and creative gardens. Both have playgrounds for children to climb on when they get bored with their parents’ fawning over the food or flowers, and these play areas are generally tied into an upcoming or recent film release children would be interested in. So, are the festivals becoming mirror images of each other? No. Are they utilizing the best aspects of both during either festival? Yes. Food and flowers have both been ingrained in the fabric of Epcot since the beginning, long before there were even festivals to celebrate either of them. 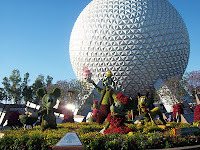 With the inclusion of Marketplaces into Flower and Garden, Epcot has given guests yet another reason to want to spend more time at the festival. Granted I would love to see the dishes offered up differ bit more from the Food and Wine offerings, beef to pork sliders and changing the cheese in the tomato salad doesn’t seem like to big a leap to me, but it was only the first year. Pristine gardens have always been a staple of Food and Wine, so it’s never been seen as a blending of the two, and yet it most certainly is. If all guests are doing is walking casually around World Showcase, noshing here and there and taking note of the beautiful gardens, then I don’t suppose it truly matters during which festival time they visit. However, for those who truly take time to get under the surface of an event and want to take some tips home, even just those printed on placards in the gardens, it absolutely matters. Cooking aficionados aren’t going to gleam as much from a horticulturist as the gardening enthusiast is, and vice versa with chefs. Allowing the events to slightly bleed over into one another doesn’t detract from Flower and Garden or Food and Wine, it simply makes them a more accurate representation of the park in which they are housed and gives each a wider group of guests to appeal to.